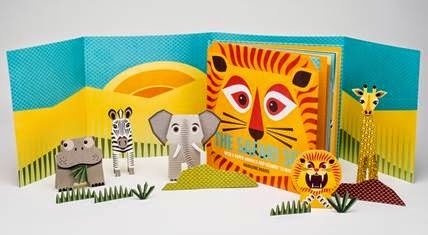 The Safari Set is a stunning children's book from designer Mibo. Written by Madeleine Rogers, The Safari Set is part of a collection of bright, design-lead children's books which also includes The Polar Pack and The Jungle Crew. The books each include a set of paper pop-out animals to make a secne that matches the story. The hardback book of The Safari Set is filled witch striking colours, bold shapely designs and fun animal characters. I felt that the design was brilliant and eye catching but that the content was a bit lacking. The text is a bit like a poem; short rhyming verses about each of the safari animals - lion, giraffe, zebra, hippo and elephant. Lara (age 5) is easily able to read this story and she had enjoyed reading it (complete with ROOAARRRRRS) to her little sister (2). I think this would be a fun picture book to read to a baby or toddler because of the bright colours and the recognisable animals. At the back of the book is a little paper pocket which contains sheets of printed paper with pop-out patterns to make paper animals to recreate the story and its scenes. This is the most fun part of the book. Lara was able to cut out and shape the animals herself (although her little sister's help wasn't really appreciated) and it really bought the book to life for her as she cross-referenced each animal to the parts of the book that describe their behaviour. The Safari Set is published by Button Books and costs around £12.99.